Don't fall victim to the perils of Python package management. The Python Package Index (PyPI) indexes an amazing array of libraries and applications covering every use case imaginable. However, when it comes to installing and using these packages, newcomers often find themselves running into issues with missing permissions, incompatible library dependencies, and installations that break in surprising ways. The Zen of Python states: "There should be one—and preferably only one—obvious way to do it." This is certainly not always the case when it comes to installing Python packages. However, there are some tools and methods that can be considered best practices. Knowing these can help you pick the right tool for the right situation. pip is the de facto package manager in the Python world. 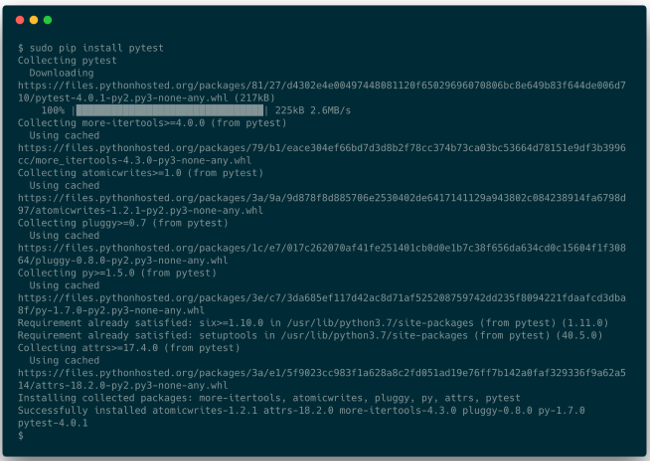 It can install packages from many sources, but PyPI is the primary package source where it's used. When installing packages, pip will first resolve the dependencies, check if they are already installed on the system, and, if not, install them. 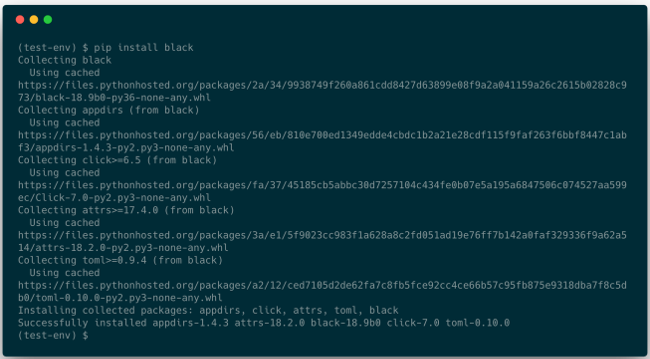 Once all dependencies have been satisfied, it proceeds to install the requested package(s). This all happens globally, by default, installing everything onto the machine in a single, operating system-dependent location. One problem with global installations is that only a single version of a package can be installed at one time for a given Python interpreter. This can cause issues when a package is a dependency of multiple libraries or applications, but they require different versions of this dependency. Even if things seem to be working fine, it is possible that upgrading the dependency (even accidentally while installing another package) will break these applications or libraries in the future. Another potential issue is that most Unix-like distributions manage Python packages with the built-in package manager (yum, apt, pacman, brew, etc. ), and some of these tools install into a non-user-writeable location. This fails because we are running pip install as a non-root user and we don't have write permission to the site-packages directory. What if we try this as root? However, one problem is that we just installed a bunch of Python packages into a location the Linux distribution's package manager owns, making its internal database and the installation inconsistent. This will likely cause issues anytime we try to install, upgrade, or remove any of these dependencies using the package manager. It could just as well have been one of the dependencies of pytest like py. The installation would have failed the same way. Another potential issue is that the operating system (OS) can use Python for system tools and we can easily break these by modifying Python packages outside the system package manager. This can result in an inoperable system, where restoring from a backup or a complete reinstallation is the only way to fix it. There is another reason why running pip install as root is a bad idea. To explain this, we first have to look at how Python libraries and applications are packaged. Most Python libraries and applications today use setuptools as their build system. setuptools requires a setup.py file in the root of the project, which describes package metadata and can contain arbitrary Python code to customize the build process. When a package is installed from the source distribution, this file is executed to perform the installation and execute tasks like inspecting the system, building the package, etc. Executing setup.py with root permissions means we can effectively open up the system to malicious code or bugs. This is a lot more likely than you might think. For example, in 2017, several packages were uploaded to PyPI with names resembling popular Python libraries. The uploaded code collected system and user information and uploaded it to a remote server. These packages were pulled shortly thereafter. However, these kinds of "typo-squatting" incidents can happen anytime since anyone can upload packages to PyPI and there is no review process to make sure the code doesn't do any harm. The Python Software Foundation (PSF) recently announced that, thanks to a monetary gift from Facebook, it will sponsor work to improve the security of PyPI. This should make it more difficult to carry out attacks such as "pytosquatting" and hopefully make this less of an issue in the future. Security issues aside, sudo pip install won't solve all the dependency problems: you can still install only a single version of any given library, which means it's still easy to break applications this way. Let's look at some better alternatives. 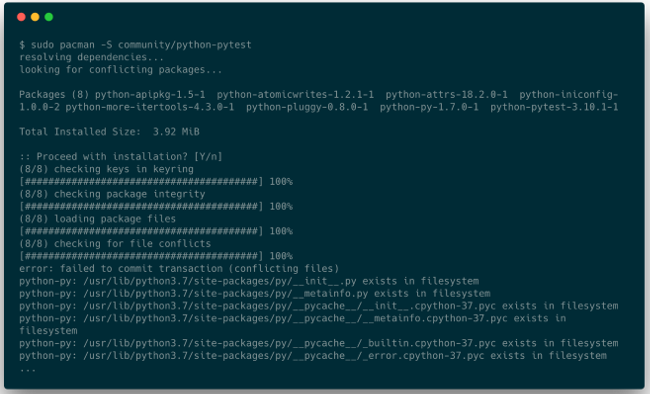 It is very likely that the "native" package manager we use on our OS of choice can also install Python packages. The question is: should we use pip, or apt, yum, pacman, etc.? Software maintained by native package managers is generally more stable and usually works better on the given platform (although this might not always be the case). The package selection is usually much smaller than what PyPI offers. Updates are slower and package managers will often ship much older versions. 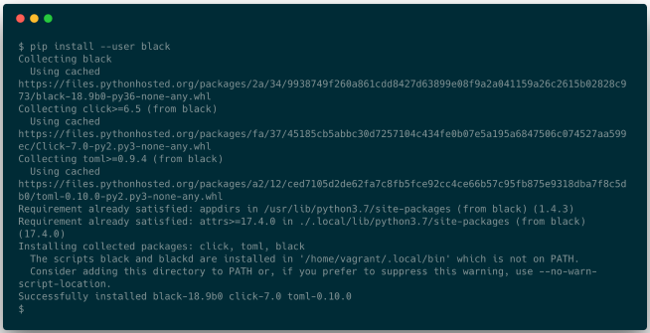 If the package we want to use is available and we don't mind slightly older versions, the package manager offers a convenient and safe way to install Python packages. And, since these packages install system-wide, they are available to all users on the system. This also means that we can use them only if we have the required permissions to install packages on the system. If we want to use something that is not available in the package manager's selection or is too old, or we simply don't have the necessary permissions to install packages, we can use pip instead. pip supports the "user scheme" mode introduced in Python 2.6. This allows for packages to be installed into a user-owned location. On Linux, this is typically ~/.local. Putting ~/.local/bin/ on our PATH will make it possible to have Python tools and scripts available at our fingertips and manage them without root privileges. However, this solution does not solve the issue if and when we need different versions of the same package. Virtual environments offer isolated Python package installations that can coexist independently on the same system. This offers the same benefits as user scheme installations, but it also allows the creation of self-contained Python installations where an application does not share dependencies with any other application. 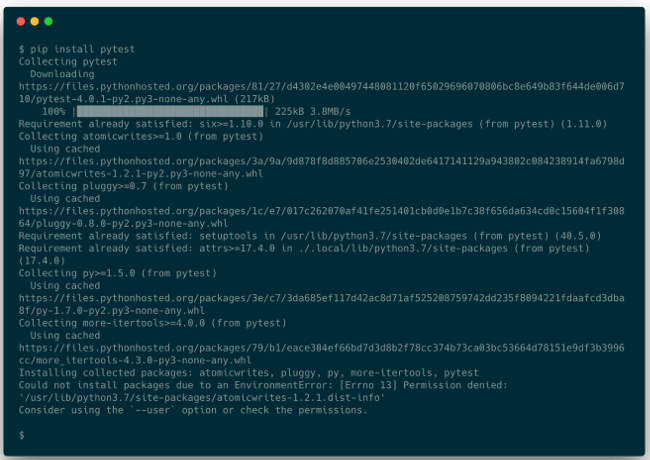 Virtualenv creates a directory that holds a self-contained Python installation, including the Python binary and essential tools for package management: setuptools, pip, and wheel. virtualenv is a third-party package, but Python 3.3 added the venv package to the standard library. As a result, we don't have to install anything to use virtual environments in modern versions of Python. We can simply use python3.7 -m venv <env_name> to create a new virtual environment. After creating a new virtual environment, we must activate it by sourcing the activate script in the bin directory of the newly created environment. The activation script creates a new subshell and adds the bin directory to the PATH environment variable, enabling us to run binaries and scripts from this location. This means that this subshell will use python, pip, or any other tool installed in this location instead of the ones installed globally on the system. Creating and activating a new environment under test-env. After this, any command we execute will use the Python installation inside the virtual environment. Let's install some packages. We can use black inside the virtual environment without any manual changes to the environment variables like PATH or PYTHONPATH. When we are done with the virtual environment, we can simply deactivate it with the deactivate function. Virtual environments can also be used without the activation script. Scripts installed in a venv will have their shebang line rewritten to use the Python interpreter inside the virtual environment. This way, we can execute the script from anywhere on the system using the full path to the script. 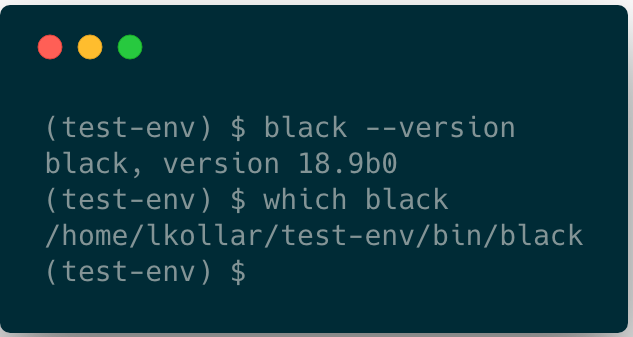 We can simply run ~/test-env/bin/black from anywhere on the system and it will work just fine. Now when we execute black, it will be picked up from the virtual environment (unless it appears somewhere else earlier on the PATH). Add this line to your shell's initialization file (e.g., ~/.bashrc) to have it automatically set in all new shells. Virtual environments are very commonly used for Python development because each project gets its own environment where all library dependencies can be installed without interfering with the system installation. I recommend checking out the virtualenvwrapper project, which can help simplify common virtualenv-based workflows. Conda is a package management tool that can install packages provided by Anaconda on the repo.continuum.io repository. It has become very popular, especially for data science. It offers an easy way to create and manage environments and install packages in them. One drawback compared to pip is that the package selection is much smaller. Never run sudo pip install. If you want to make a package available to all users of the machine, you have the right permissions, and the package is available, then use your distribution's package manager (apt, yum, pacman, brew, etc.). If you don't have root permissions or the OS package manager doesn't have the package you need, use pip install --user and add the user installation directory to the PATH environment variable. If you want multiple versions of the same library to coexist, to do Python development, or just to isolate dependencies for any other reason, use virtual environments. László Kiss Kollár - László Kiss Kollár is a senior software engineer at Bloomberg, where he works on the Python Infrastructure team. He has close to 15 years of industry experience and has worked on a diverse set of projects, such as optimising code for vector processors, creating a distributed JVM, and generating automatically produced news content. Could you explain why you did not even mention pipenv? I wanted to focus on the basics of package management in this article and pipenv is more geared towards managing development environments. Also, conda does also come with pip so you can install packages not in the conda repository thus giving the best of both worlds. We used pyenv during the development of SOURCEdefender as this enabled us to support all versions of Python on Linux, Windows, and macOS platforms. We even have it running on a Raspberry Pi too! Also, using something like Dircmd to automatically activate and deactivate a virtual environment as you enter or exit a venv folder is great too! To simplify common venv-based workflows you can use venvtools. Venvtools made managing development virtual environment easier via series of command. venvtools command similarly like git command. You just press [tab] twice for commands action (create, list, remove, activate, deactivate, goto) and environments auto completion. Disclaimer: I’m the author of venvtools. Please let me know for any bug or improvements suggestion.